Considered a modern day master of the arts, Esad T. Ribić has wowed comic book fans with his work on Loki, Silver Surfer: Requiem, Ultimates, Thor: God of Thunder, and, most recently, Secret Wars. However, despite being a relatively new name known to many of his admirers, Ribić has seen his work published for over two decades starting in his native Croatia. Born in 1972 in Zagreb, Croatia, Ribić was a fan of science fiction and mythology who knew he wanted to dedicate his life to producing art. He attended the School of Applied Arts and Design in his home city as he also worked for Zagreb Film (an animation studio) while attending high school in the late 1980s. While certainly his education at school offered valuable insight into his art, Ribić attributes his on-the-job training to have been more enlightening where he started as an assistant animator before moving on to be an animator and then background artist. It was during his years at Zagreb Film that Ribić would begin work in the comic field as a pastime where he worked on Bastei’s German youth horror comic Gespenster Geschichten (“Ghost Stories”) and Croatia’s Plavi zabavnik (“Blue magazine”). It was around this time Croatia would become embroiled in war as the country fought for independence from Yugoslavia where Croatian Serbs violently combated secession. The Croatian economy would suffer significant losses in the face of this war with Zagreb Film going bankrupt. Without a job, Ribić sent art samples to French comic publishers and Dark Horse Comics only to be rejected. The artist collaborated with local writer Miljenko “Miki” Horvatic to produce Code Name: Scorpio which would be picked up to his surprise by Antarctic Press in 1996 (considering the publisher’s penchant for the manga-style). His first break into the American market, Ribić and Horvatic continued working for Antarctic with Shotgun Mary: Son of the Beast and Warrior Nun: Frenzy. Edvin “Eddie” Biuković was a Croatian artist and close friend of Ribić’s who found work at Dark Horse and would introduce his friend to DC Comics editor Axel Alonso. 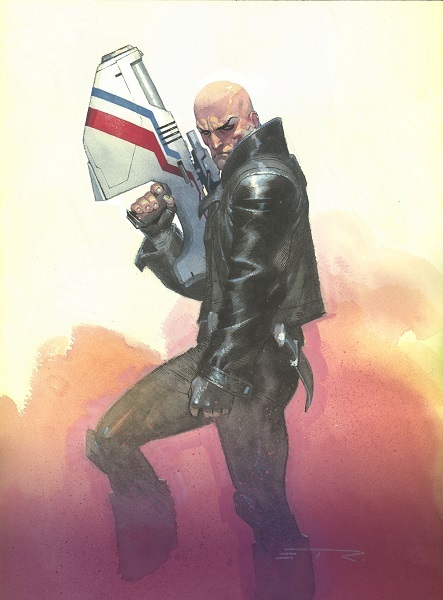 Coming to work for Vertigo, Eddie Biuković was the artist for the revival of the franchise Human Target in 1999 with Axel Alonso as his editor. Alonso was a fan of Biuković’s work and likewise was a fan of his friend Esad Ribić’s art. 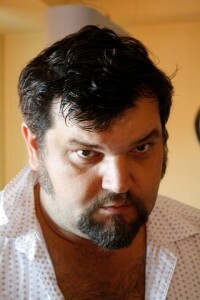 Ribić would be signed in short order to work for Alonso at Vertigo on Brian Azzarello’s “Native Tongue” for the science fiction anthology series Strange Adventures and Scott Cunningham’s “Mondays” for the horror anthology series Flinch in 2000. This assignment would lead to Ribić teaming with Robert Rodi for the series Four Horsemen. Forced to be aligned with the fifth-week event V2K (a play on Y2K with the V alluding to Vertigo), Ribić was rushed to crank out the project which the artist saw his work as not being effectively realized. Around this time, Ribić would be offered to come work for Marvel which started an ongoing fifteen year relationship. His first assignment would be to hurriedly finish the mini-series X-Men: Children of the Atom who had lost artist Steve Rude halfway into the book’s run. This lead to fill-in/one-shot work on various X-titles like Cable, Uncanny X-Men, and Ultimate X-Men before landing the maxi-series The Brotherhood in 2001 which Ribić described as a nightmare to work on leading to his leaving the title a few issues in. A painter, Ribić was turned off by the tight deadlines in the x-universe which saw him compromise his artistic integrity and work ethic to meet schedule. 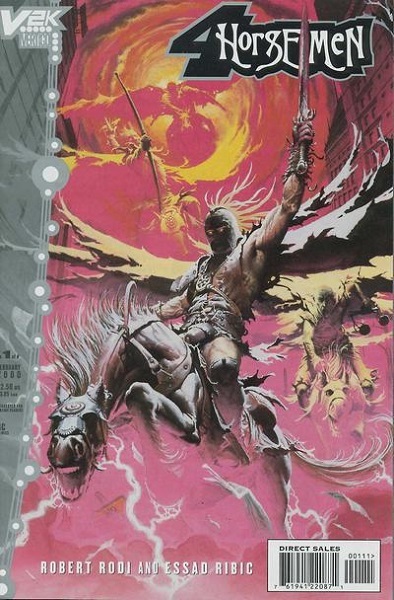 While producing work for American audiences, Ribić continued to provide art for his native Croatia especially for the publisher Algoritam where he’s produced cover art for the translated works of Lois McMaster Bujold, George R. R. Martin, and Robert E. Howard. In 2002, Ribić would get to sink his teeth into his own pace as a cover artist at Marvel. Shortly after Esad Ribić made his way to Marvel Comics, his friend Axel Alonso would follow. As one of the major guiding forces for Vertigo, Alonso would tackle Marvel’s icon Spider-Man and help found the mature imprint Marvel MAX. Perhaps his most notable work in the early part of his Marvel career was revamping X-Force (under Peter Milligan and Mike Allred) and Incredible Hulk (under Bruce Jones and John Romita, Jr.) to much acclaim leading to his taking on Wolverine. 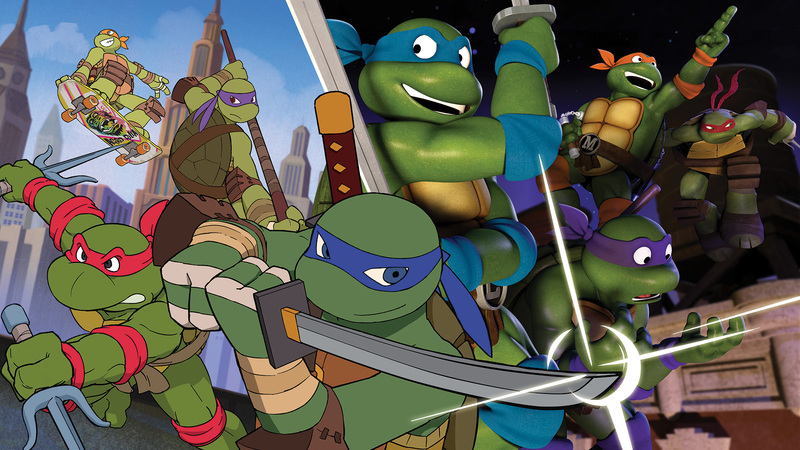 Ribić would come on as the ongoing cover artist for the title becoming its most consistent creative force while various writers and artists worked on the book. 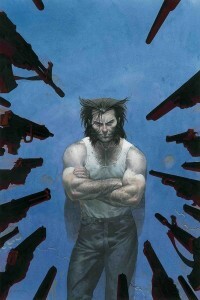 It was after about a year of working on Wolverine that Ribić would tackle an assignment that arguably put him on the map in the industry. Axel Alonso was seemingly bouncing around Marvel’s editorial office juggling one book and then another eventually ending up as the editor for the Marvel Knights imprint in 2002. Created in 1998 by Joe Quesada, the line emerged following Marvel’s Chapter 11 bankruptcy and featured more mature books generally employing more independent creators than those that were already under the publisher’s umbrella. A major hit for the company, it arguably led to Quesada being made the editor-in-chief of Marvel in 2000 (the first graphic artist to earn that position). Under Alonso’s watch, the imprint sought an original series featuring Thor’s nemesis (and adopted brother) Loki. Alonso would eventually approve the pitch made by Robert Rodi that saw the book from Loki’s eyes that both made him a sympathetic character and posited the notion of what would it mean if Loki actually succeeded in taking over Asgard (it’s possible such a story could have inspired the approach of Loki’s depiction in the Marvel Cinematic Universe). 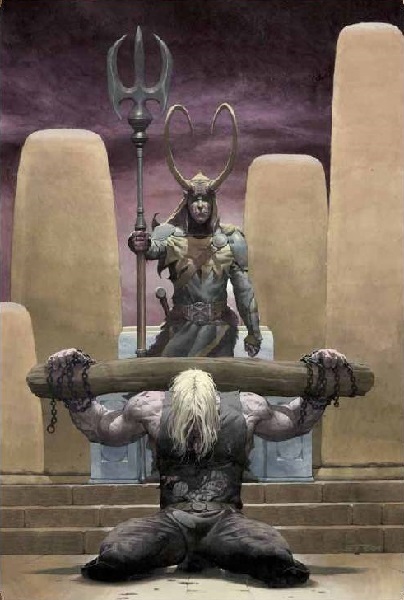 Alonso and Rodi, of course, had previously worked together at Vertigo on Four Horsemen and their reunion was brought full circle as Esad Ribić would join them to provide the visual art for 2004’s Loki. The assignment would largely be the first major project for Ribić whose dynamic and entrancing style enchanted readers (especially those in Europe where in Spain, he was nominated for two Haxtur Awards, winning one for his cover art). As already mentioned, Ribić is a longtime fan of mythology and he brought the grand pageantry of dueling gods to life amid Rodi’s Shakespearean-inspired writing. 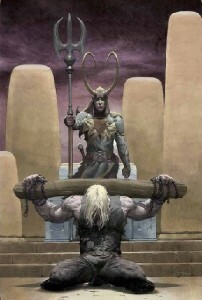 A success for the company, Ribić would become tapped to provide more similar limited series to follow as Rodi became no stranger to the world of Asgard (while Loki was adapted into the motion comic Thor & Loki: Blood Brothers in 2011 just prior to the release of the major motion picture Thor). The success of Loki would lead Esad Ribić to next produce 2007’s Silver Surfer: Requiem. 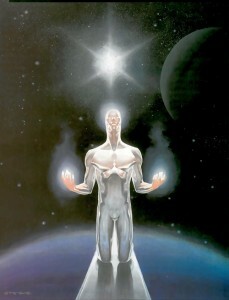 Published under the Marvel Knights banner, penned by J. Michael Straczynski (who was coming to the end of his critically-acclaimed six-year run on The Amazing Spider-Man), and timed to coincide with the release of the film Fantastic Four: Rise of the Silver Surfer, Silver Surfer: Requiem featured the Power Cosmic-endowed hero coming to terms with his imminent demise. Wracked with a terminal illness, the Silver Surfer tries to find final contributions he can provide using his godlike Power Cosmic before returning to his home Zenn-La and his beloved Shalla Bal to meet his final fate. Critically-acclaimed for its deeply emotional beats and the awe-inspiring artwork of Ribić, the work is considered today a modern day classic and arguably what made Ribić a most sought after talent in the industry. Ribić would continue this new formula of experimental limited series with Sub-Mariner: The Depths the following year. Penned by Peter Milligan (who, as noted, revamped X-Force) for the Marvel Knights imprint, the series follows an alternate universe where superheroes don’t exist and Atlantis is believed to be a myth. A submarine crew venture to uncover the truth about Atlantis only to meet a vengeful Namor who will protect its secret existence at all costs. Sadly, the series would under perform the previous mini-series. Following Sub-Mariner: The Depths, Esad Ribić would have a brief run on Uncanny X-Force with the story “Deathlok Nation” by Rick Remender before teaming with Jonathan Hickman on Ultimate Comics Ultimates for nine issues. 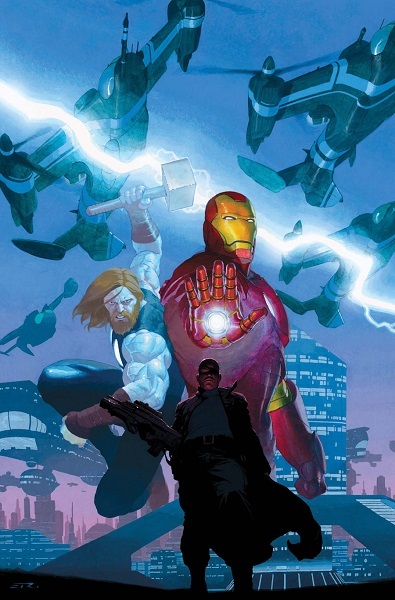 The series was a relaunching of the Ultimates (Ultimate Marvel’s version of the Avengers) in the wake of the event Death of Spider-Man which featured twelve issues penned by Hickman (his final three drawn by Luke Ross) as the team face the threat of Reed Richards. This turn in his career would see Ribić walk away a bit from his paint brush and be featured more as a penciller and inker instead which added a new depth to his art by showing an expanded range of his talent. Unfortunately, the sales were not as good as Marvel projected they would be and Hickman and Ribić decided to walk away from the title. Despite this, Ribić would be nominated for a Broken Frontier award for Best Artist. 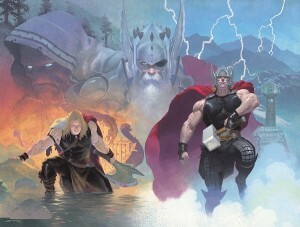 In 2012, Ribić would return to more familiar territory with Thor: God of Thunder. In Fall 2012, Marvel rebranded itself with Marvel NOW! in the wake of the re-emergence of the Phoenix on Earth. Part of this meant relaunching many series as The Mighty Thor came to an end and gave way to Thor: God of Thunder. Jason Aaron (Scalped, Wolverine and the X-Men) and Esad Ribić, who had previously worked together in 2009 on the one-shot Dark Reign: The List – Wolverine, teamed together for Thor initially telling a story about the God of Thunder throughout three periods of his life which all involved facing a god-killer. The idea was pitched to Axel Alonso, who by this time was made the Editor-in-chief of Marvel, by Aaron and Ribić who wanted to collaborate together again. 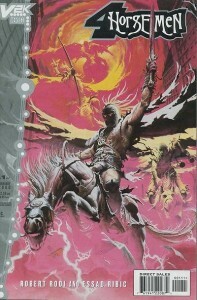 Ribić would produce the interior art for most of the book’s first year and subsequently six more issues. Fans regard this run arguably some of the best comic art of its time period, Ribić intermingling his love of mythology and science fiction as theatrical deities traverse grand kingdoms among the stars. Ribić would be nominated for an Eagle Award for Artist (Painted Work) 2012 and Broken Frontier award for Best Artist 2013 for his work on Thor. While Ribić has often commented on a distaste of ongoing narratives reliant upon continuity, it seemed with Thor he had made a turn in his career where Marvel would come to more-and-more rely on his work in its main universe. 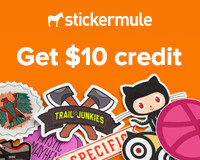 Such would especially be true when Ribić would be selected to draw the company’s major event of 2015 in Secret Wars. In 1984, Marvel would create something that arguably changed the comic book industry. While producing a mini-series in 1982 called Contest of Champions that featured many of Marvel’s major characters in a crossover that was intended to coincide with the 1980 Olympics, the story was self-contained and largely had no effect on the overall narrative of the publisher’s storylines. 1984 would see Kenner Toys (who had changed the landscape of the toy market with Star Wars) acquire the license to produce action figures based on DC Comics’ properties (resulting in the popular Super Powers Collection), leading to competitor Mattel to then shortly thereafter approach Marvel with a similar proposal. The result would be the Secret Wars toyline with accompanying tie-in comic book series. Whereas the toys were less than popular, the comic which featured many of Marvel’s biggest names was a hit and became a driving force for the overall company narrative for years to come (which largely created the concept of comic book events). Marking the thirty year anniversary, Marvel produced another Secret Wars event series in 2015 borrowing elements from DC’s Crisis on Infinite Earths (the publisher’s 1985 event which saw its multiverse collide). 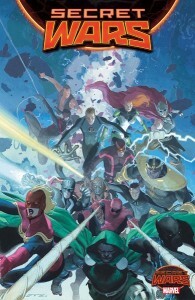 Conceived roughly six years ago by writer Jonathan Hickman, his work has seen seeds planted about Secret Wars before finally being approved to prepare the event’s culmination in the wake of 2012’s event Avengers vs. X-Men leading to Hickman setting the stage for the project during his two year run on Avengers and New Avengers. 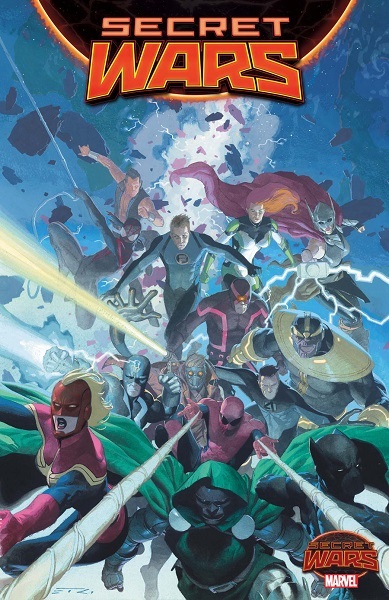 Hickman, who had as noted previously collaborated with Esad Ribić on Ultimates, knew as soon as he was approved that he wanted to be paired with the visual artist on the main title (feeling Ribić was perfect for what he wanted to do). Thus, the pair are telling essentially the tale of the demise of the Marvel multiverse over the span of the title’s nine (originally eight) issue series set to end this December. Ribić is given the Herculean task of tackling many of the stars of Marvel, main universe and beyond, that alternate from tense dialogue to intense battle to worlds colliding (figuratively and literally) committing himself to the page giving the fans what they want out of such a massive undertaking. Secret Wars will result in “All-New, All-Different Marvel,” another rebranding for the company where the main Marvel Universe and Ultimate Universe will be merged together. Following Secret Wars, Ribić is set to draw the final four issues of France’s Humanoids’ series Metabaron by Jerry Frissen (Lucha Libre, The Zombies That Ate The World), a sixteen-issue limited series sequel to The Metabarons beginning in October 2016.